¶ 2 Leave a comment on paragraph 2 0 Hobo imagery appears in many well-known traditional songs, such as Guthrie’s I Ain’t Got No Home, Hobo’s Lullaby, East Texas Red, and Jimmy Rodger’s Waiting On a Train, Hobo’s Last Mediation, and Hobo Bill’s Last Ride. The hobo image is also included in several early Dylan songs, including Only a Hobo, Pledging My Time, and Bob Dylan’s 115th Dream. Bob Dylan himself has even been mistaken for a hobo. ¶ 5 Leave a comment on paragraph 5 0 Guthrie’s I Ain’t Got No Home treats the hobo in a similar manner. ¶ 8 Leave a comment on paragraph 8 0 Dylan, who covered I Ain’t Got No Home at the 1968 Guthrie tribute concert, uses the hobo image in a similar way in both Only a Hobo and Man in the Street. Other hobo-like characters that appear in Dylan songs, such has “Napoleon in rags” and the “mystery tramp”, are meant to be to viewed sympathetically. ¶ 9 Leave a comment on paragraph 9 0 I Am a Lonesome Hobo changes that pattern up. This hobo is not a heroic figure at all. Written in the first person, the hobo describes himself as a pretty despicable person, who is sentenced to “wander off in shame”. 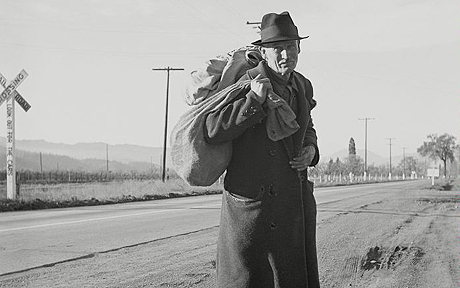 Guido Biero, in his book Life on the Tracks, writes: “the hobo is a simple metaphor for moral poverty”. ¶ 10 Leave a comment on paragraph 10 0 What did the hobo do to deserve his punishment? In short, he was selfish, judgmental, and didn’t share. He didn’t live by the “golden rule”. ¶ 11 Leave a comment on paragraph 11 0 Like many of the songs on John Wesley Harding, Dylan leans on the wisdom of the Bible. This song is no exception, echoing familiar sentiments like “do unto others” (Luke 6:31), “judge not” (Matthews 7:1-2), “Lay not up for yourselves treasures upon earth” (Matthew 6:19). ¶ 12 Leave a comment on paragraph 12 0 Many commentators have noted a similarity between this song and the biblical story of Cain. ¶ 13 Leave a comment on paragraph 13 0 In the book of Genesis, Cain and Abel are brothers, the children of Adam and Eve. In a fit of rage and jealousy, Cain kills Abel. God punishes him by making him a “fugitive and a wanderer on the earth”. The similarities between Dylan’ hobo and Cain are very clear (see lyrics below). The Cain and Abel story influenced, to varying degrees, several other Dylan songs, including Every Gain of Sand, Not Dark Yet, and Tweedle Dee & Tweedle Dum. ¶ 14 Leave a comment on paragraph 14 0 Dylan commentators commonly mention several other sources that might have inspired the song, including Arthur Rimbaud’s My Bohemian Existence, Coloridge’s The Rime of the Ancient Mariner, and the Polonius character in Shakespeare’s Hamlet. ¶ 15 Leave a comment on paragraph 15 0 Like much of John Wesley Harding, the song seems to be in part a repudiation by Dylan of his own mid-sixties persona, which was full of judgment and self-righteousness (e.g. Masters of War, The Times They Are a-Changin’, the interview with the Times reporter in Don’t Look Back). “And hold your judgment for yourself / Lest you wind up on this road” is not a lyric the Like A Rolling Stone time-frame author would have delivered. ¶ 16 Leave a comment on paragraph 16 0 Dylan has never really had a mind-blowing philosophy of life (not saying he should), but I’ve always though the final lines a bit pedestrian. ¶ 22 Leave a comment on paragraph 22 0 Dylan has never played this song live. Covers versions are also fairly rare. ¶ 23 Leave a comment on paragraph 23 0 Julie Driscoll and Brain Auger give it a sixties-style treatment.